For 2016 OFBPA will continue its strong support for the Eastside Emergency Family Shelter , located adjacent to MedStar Franklin Square Medical Center , at 9100 Franklin Square Drive Baltimore, MD 21237. OFBPA began supporting the Eastside Emergency Family Shelter in late 2011, and developed a monthly collection program focused on seasonal needs for the shelter, along with numerous staple items that continuously require restocking. The shelter houses 125-140 women and children on a regular basis and relies heavily on donations by the community. All items from our monthly list or the shelter wish list are welcome at any time. Items may be brought to any event/meeting or dropped off at the shelter directly. Please mark OFBPA and attention April Stevens. OFBPA is asking for your business to support the Eastside Emergency Shelter through collections of the following staple items, which are put to use immediately. To arrange a delivery of your donation, please contact April Stevens, - Volunteer Coordinator at Community Action Network, Inc. at 410-285-4674 ext. 211, astevens@canconnects.org or drop off Monday thru Friday 9AM - 5PM. No weekend deliveries, they are not staffed to handle deliveries Saturday or Sunday. Please indicate the donor on any donations - also donation forms are available by request at the shelter. Baby powder, oil, lotion, etc. School Supply Drives-- OFBPA collects school supplies all year for Pre-K to 12th grade. Please note the Eastside Emergency Family Shelter is managed by the Community Assistance Network , an authorized nonprofit 501(c) 3 organization. 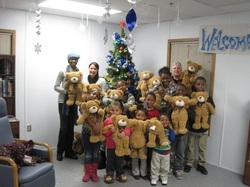 Read about OFBPA's 2015 Holiday Party at The Eastside Emergency Family Shelter!